Remember when I said I wanted to teach yoga? Ha. Well. I still do — don’t worry. But all of a sudden I am TEACHING YOGA — I have six classes on my schedule next week… which is way more than I ever anticipated. Only three of them are my regularly scheduled classes (which will continue indefinitely! ), but I’m subbing for three more. I was thinking I’d be teaching like ONE class per week — just to practice and get better … but I guess when it rains it pours! I’m excited, and hoping that this means my learning curve will be a lot steeper. I know I still have a lot of experience to gain before I feel really comfortable at the front of the class. Luckily I’ll have plenty of opportunities to challenge myself! 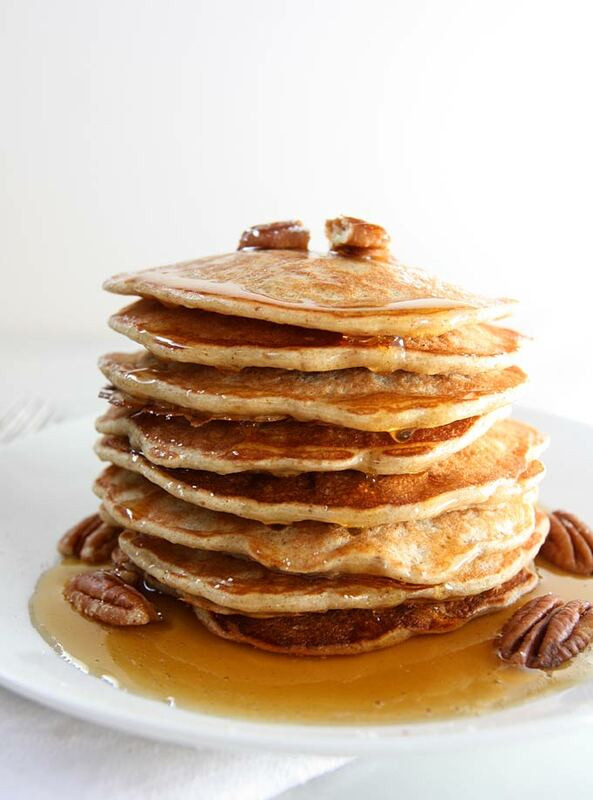 I do feel comfortable in front of these pancakes — this I know for sure! I first made these a few years ago, and revisited them this week with a few tweaks (and non-iPhone photography). When I take a look at my old recipes (and even how I wrote them, and in what order I put the ingredients) I can really see how far I’ve come in the last few years. Yes, it’s slightly horrifying to see what I actually did, but it’s a great reminder that with practice: we can get better! So, I’m going to assume the pancake/yoga-teacher improvement continuum is pretty much the same. Err… you know what I mean. These panqueques have mashed banana (!!) 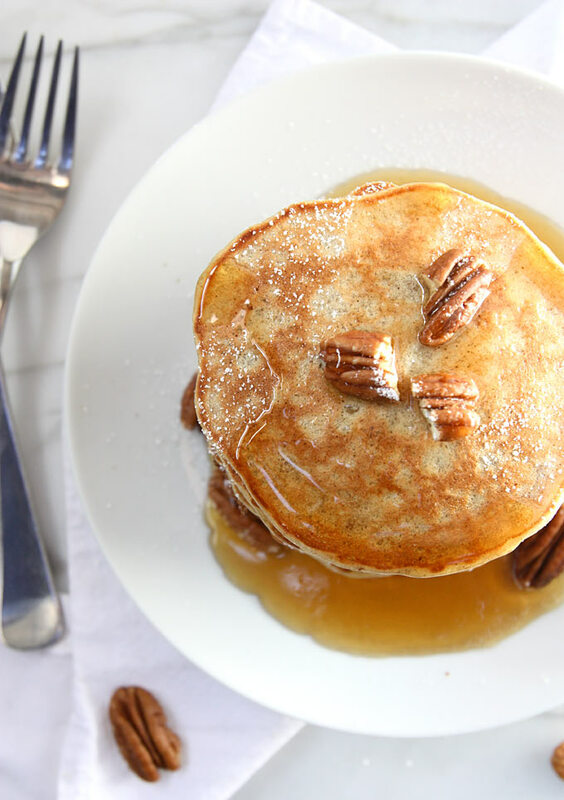 and pecans — so they’re basically like this banana bread in pancake form. AKA AWESOME. Whisk together the eggs, milk, melted butter, vanilla, and banana. In a separate bowl, whisk together the remaining ingredients. Combine with the wet ingredients and whisk until mostly combined (don’t over-mix). Heat a nonstick griddle over medium heat, and when it’s hot pour 1/3 cup at a time onto the griddle. 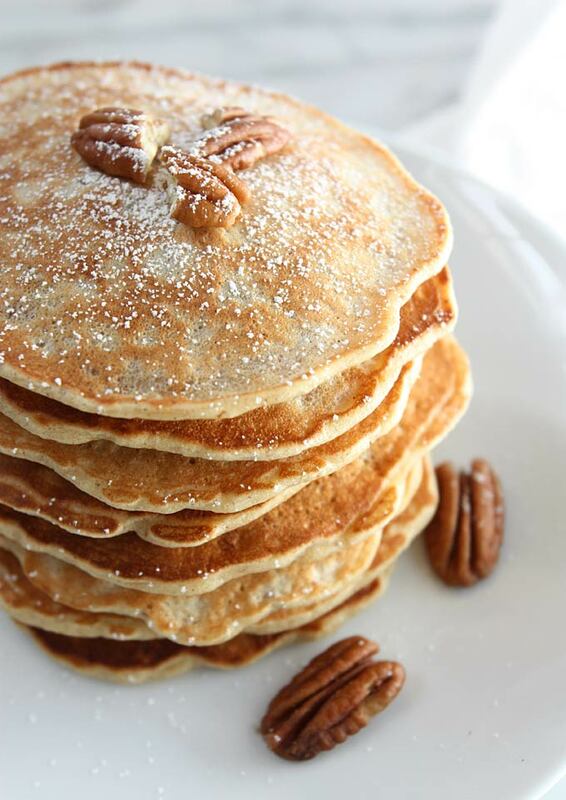 Cook until each side is golden brown, and serve topped with maple syrup and extra pecans. 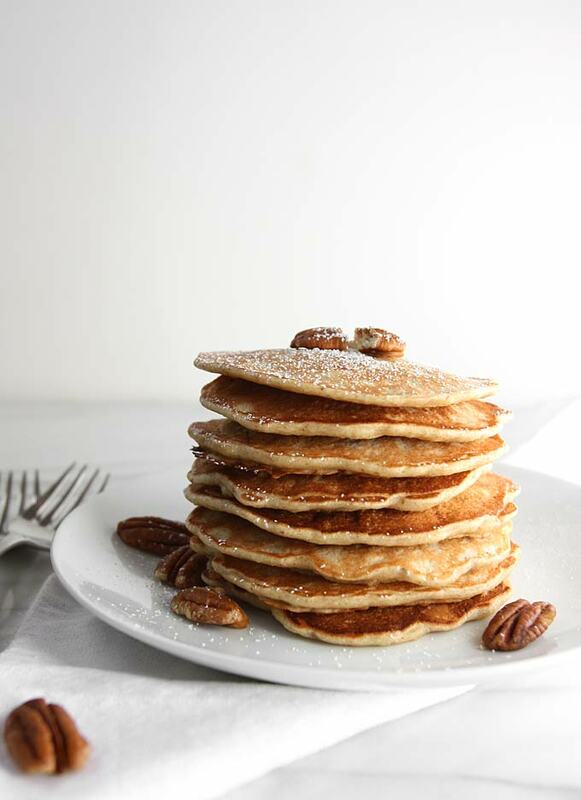 Preheat the oven to 200F and place the done pancakes on a baking sheet (in the oven) to keep them warm while you cook! My kids love them! Thanks for the recipe!